Soon after my post on 7th Jan 2011 about partnerships, Deepak Raj contacted me with his interest and since then we have been good friends. We have been sharing lot of things with each other in emails apart from blogging. In May, he wanted to interview me for his upcoming book and it was an honour for me to be interviewed by Deepak. On December 26th 2012, he comes out with Blog Rockstars. 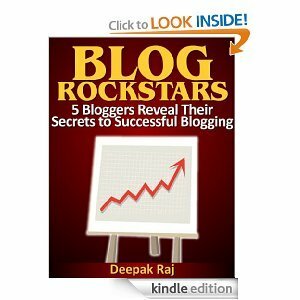 Other Bloggers interviewed by Deepak in his book. BTW this is yet another interview published on my Birthday. Last Year it was My Interview in LiveMint. I now hope for an hat-trick of interviews on my Birthdays. It is Kindle Book that you can buy the book from amazon and read it on any kindle enabled device. If you don’t have kindle, you can install a Kindle app on your iPad or Android tablet and read the book or can even install Kindle App for your PC or MAC and read the book.